The National Association of State Energy Officials (NASEO), the Energy Futures Initiative (EFI), BW Research, and energy and workforce policy experts discussed the public release of the 2019 U.S. Energy and Employment Report (USEER) on Wednesday, March 6, at the National Press Club in Washington, D.C. 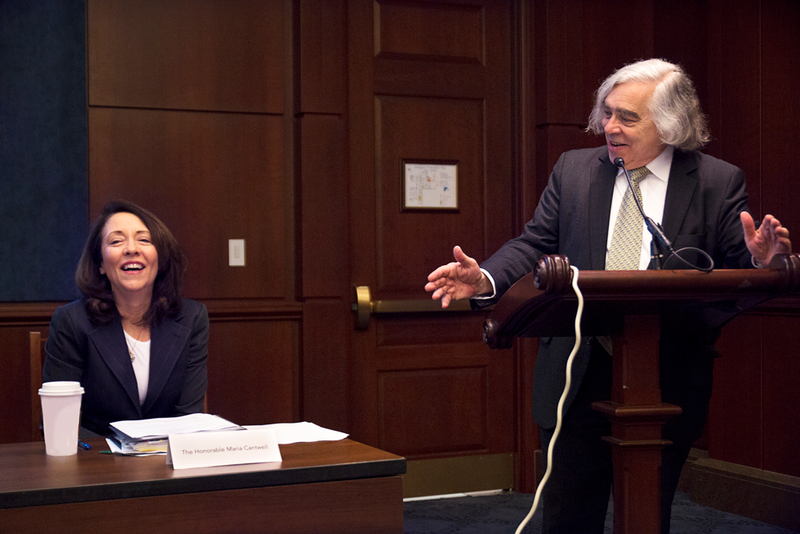 The event, convened by David Ellis, EFI’s Director of Communications and Policy Strategy, featured a panel of energy experts, led by former Energy Secretary Ernest Moniz, President & CEO of EFI, and David Terry, the Executive Director of NASEO. The U.S. Energy & Employment Report (USEER) is an annual report, based on a survey administered to over 30,000 employers across 53 different energy technologies. Originally published by the U.S. Department of Energy (DOE) in 2016, the USEER was adopted in 2018 by the Energy Futures Initiative (EFI) and the National Association of State Energy Officials (NASEO) under the identical, federally-approved protocols as previous editions. The 2019 Report is the second year of this partnership between the two nonprofit entities. The USEER survey is designed to supplement Federal Bureau of Labor Statistics (BLS) employment data to provide a deeper and more complete understanding of the following sectors of the economy: Electric Power Generation; Fuels Production; Transmission, Distribution, and Storage; Energy Efficiency, and Motor Vehicles. For the first time, the 2019 USEER includes wage data by sector. Value of the USEER. The USEER provides value to energy sector employers, public officials, policy makers, and trade associations by providing a common methodology and data set on employment across all energy technologies and fuels. In addition to a uniform standard for enumerating energy employment, the USEER provides year-by-year data and forward-looking employment projections on a range of employment issues that can support local, state, and regional initiatives seeking to coordinate workforce development and economic development strategies and programs. Currently, 10 states, six trade associations, and seven foundations are supporting the USEER. In celebration of International Women’s Day on March 8, the Department of Energy cited the USEER to call attention to the gender gap in energy jobs in the United States: “In the U.S. Energy & Employment Report you can find figures on women’s employment in each sector of the energy workforce (did you know the electric power generation sector has the highest percentage of women?). The report was released just this week by National Association of State Energy Officials and the Energy Futures Initiative.” Read more here. The United States is facing a shortage of workers trained and willing to take blue-collar construction jobs in the energy sector, even as oil and gas production soars and the power sector continues to transform, according to a new report. The Energy Futures Initiative (EFI) and the National Association of State Energy Officials found in a study released yesterday that the hiring challenges are not evenly spread among the fossil fuels, nuclear power and renewable energy sources that are battling for prominence. All parts of America’s energy industry are having trouble hiring workers, according to a new report out today. Driving the news: Hiring difficulty last year was cited by more than three-quarters of employers in areas like energy efficiency, electric power and vehicles. This is an increase of nearly 7% over 2017, per the annual report that had been conducted by the Energy Department and is now done by two nonprofits. A joint project from the National Association of State Energy Officials and Energy Futures Initiative, the new must read for the American job market is out: The 2019 U.S. Energy and Employment Report. With all time records being set for total Americans in the labor force, energy continues to outpace the other sectors in terms of new hires. Our energy jobs boom begins with oil and natural gas, together supplying nearly 65% of all the energy that enables our $21 trillion economy. As compared to 2017, U.S. crude oil and gas production boomed 16.3% and 12% respectively in 2018, so the jobs followed. The 2019 U.S. Energy and Employment Report (USEER), released yesterday, shows traditional energy and energy efficiency sectors "continued to outperform the economy as a whole," and added 152,000 new jobs last year.